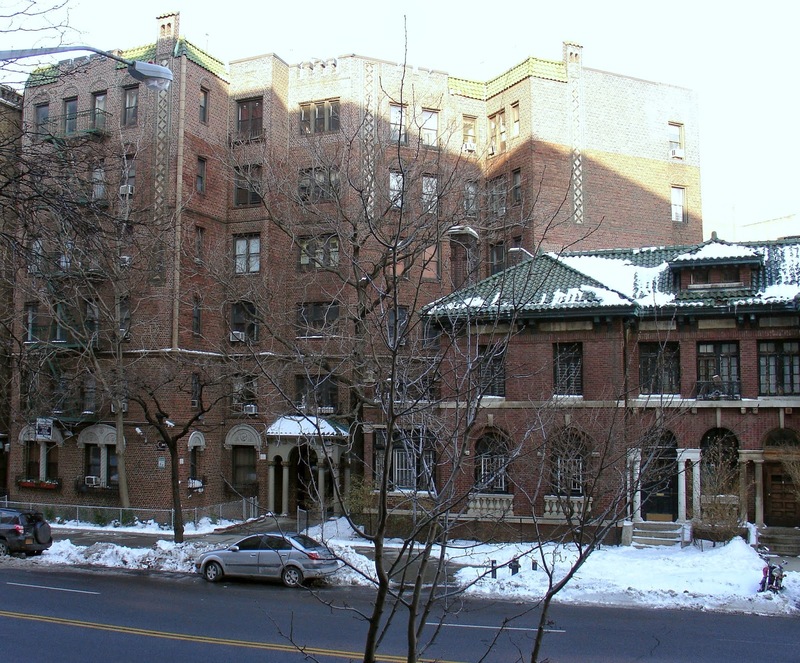 Moving away from the Beaux Arts apartment buildings on the opposite side of Riverside Drive, with their parlor, dining room, and library combinations that could be opened into a large entertainment space, 807 featured fifty-two suites of three-to-five rooms. The special features were geared towards comfortable family living rather than grand entertaining: breakfast nooks with the kitchens, mothproof cedar closets, and radio service provided to every apartment by a rooftop aerial. 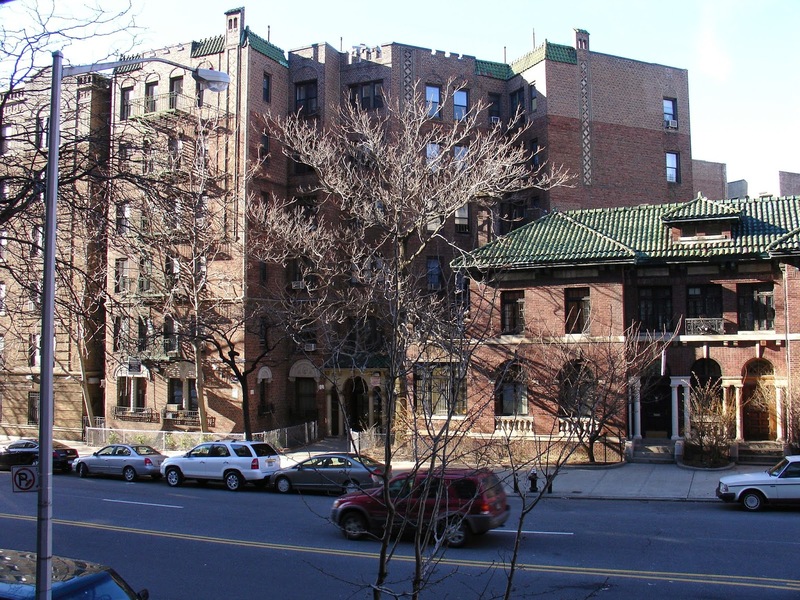 The Times reported that it was “a copy of a grand ballroom of the Italian renaissance period.” On Riverside Drive, the ballroom was below street level, so 807 tenants used a special staircase to reach it. Berler had his own passageway from his home, giving rise to legends that he used it for assignations with a mistress living at 807. 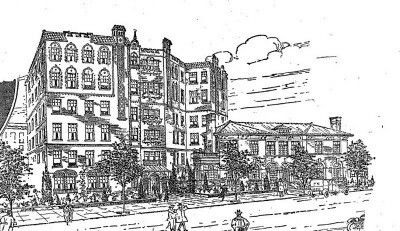 On 158th Street, the ballroom was at grade and Pelham wisely gave it a separate exterior entrance, which increased its versatility and potential use. Berler understood his market: 807 was more than two-thirds leased before completion in December 1924. The following May, Berler and his wife dedicated the ballroom with “a vocal and instrumental concert followed by a formal dinner and dance” for more than 250 people. The ballroom may have been a clever selling point for the building, but if newspaper coverage is any indication, residents did not make much use of it. The Times reported one engagement party that Mr. and Mrs. Robert H. Benely gave in honor of their daughter Madeline. The Benelys, who lived on 164th Street and were not residents at 807, called the venue the “Ballroom de Luxe” for the evening. Almost ten years later, Mr. and Mrs. Barney H. Skall feted their daughter Evelyn Wald at 807 Riverside Drive, on the occasion of her engagement to Mr. Lee S. Kuhn, but they did not make clear whether the entertainment was in the ballroom or in their apartment. Given the size of the apartment, the ballroom was the more likely location. 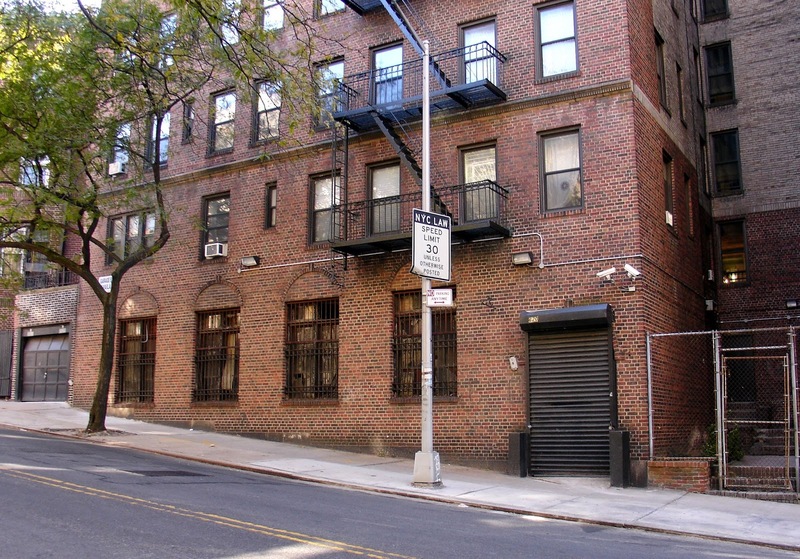 Around 1934, “The Washington Heights Town Club” began using the ballroom for social and cultural events, probably using the exterior door for guests. A 1938 Times article suggests that 807 residents had formed the club, but gives no indication whether they restricted membership to to residents of the building. A key organizer was tenor Hunter Sawyer, who conducted the Washington Heights Oratorio Society in a performance of Saint-Saen’s “Christmas Oratorio” and assorted Christmas carols in December 1934. The ensemble returned for a concert in the spring and then a concert performance of Gilbert and Sullivan’s The Mikado. Cellist Phyllis Kraeuter and pianist Leonore Kraeuter joined Sawyer for a recital in March and in May, violinist Florizel von Reuter performed in recital (without Sawyer). In 1935, Sawyer opened the season with a performance of sea chanteys accompanied by a quartet known as the Grenadiers. Following were a reception and dance. 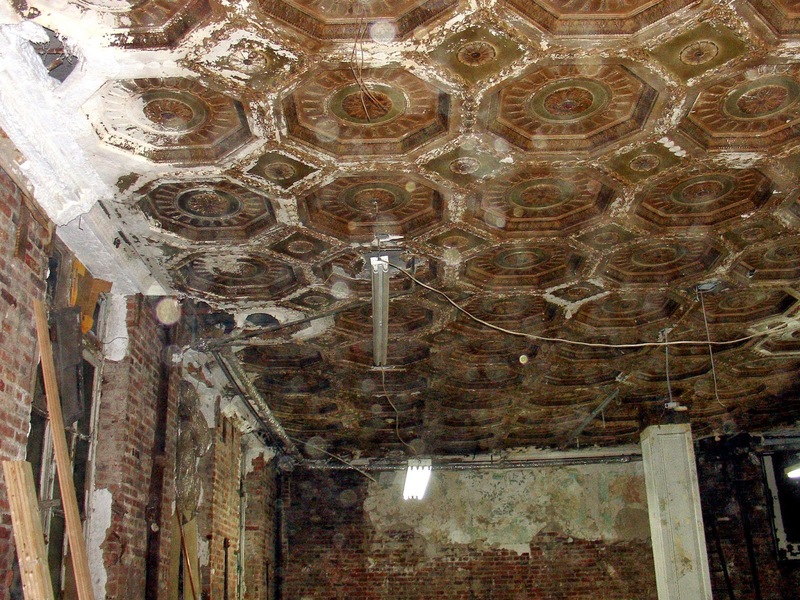 Two years later, the Times reported that the Professional Artists Group was using the ballroom as its headquarters. In April, M. A. Rasko and Robert E. Dodds gave painting demonstrations, followed by election of officers for the year and a discussion of exhibition plans. In November, Stuart Davis spoke “in defense of abstract art.” Then several artists participated in an open discussion of modern art. John J. Newman and “Red Robin, an Indian painter of the Southwest,” gave demonstrations in January 1941. Besides his description of Indian painting, Red Robin demonstrated Indian dance. 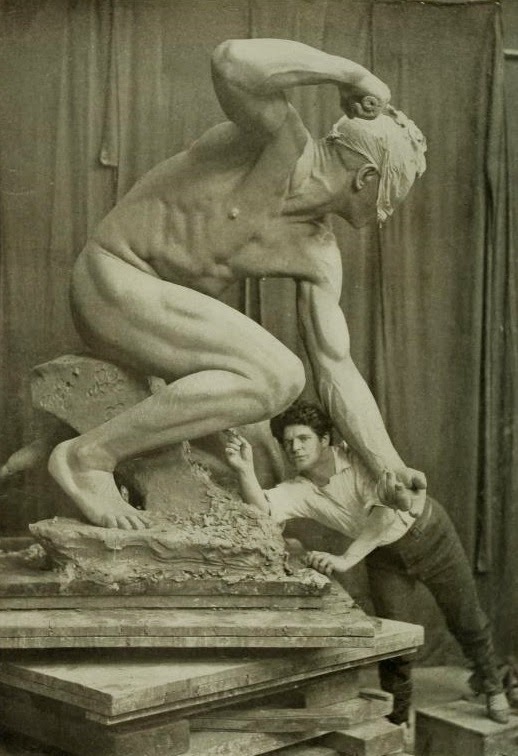 The artists group was still there in 1942, when Theresa Bernstein gave “a pastel demonstration” and “a talk on modern art, illustrated with slides.” At the end of World War II, the Bronx Jewish Sports Club was using the room as its headquarters and activities ranged from dancing to games. After 1942, all mention of Berler’s ballroom abruptly disappears from the press. Perhaps he curtailed all use or perhaps he temporarily converted it to another use, though the current layout suggests it has never been converted into an apartment or divided for other purposes. For decades, the room has remained as an oddity of an earlier time and few people venture there, not even residents. 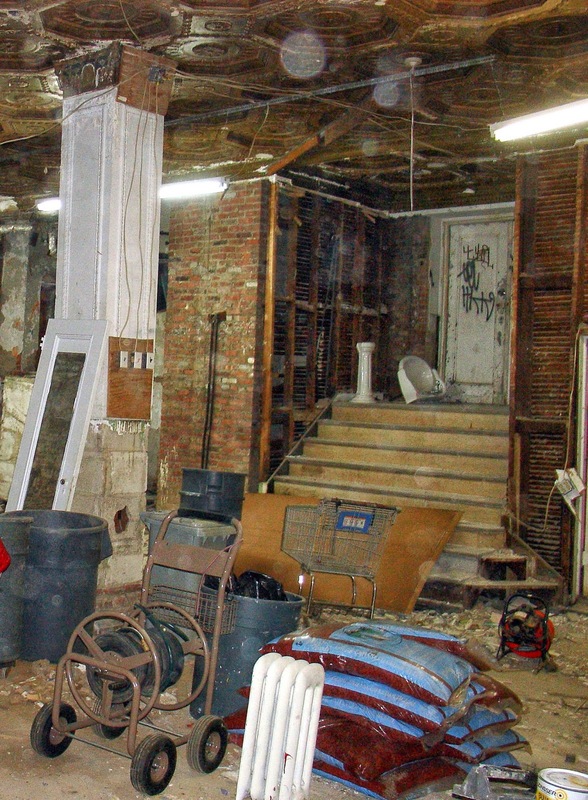 Today, the former ballroom is stripped its former glamor and used as a storeroom. However, 807 itself is in the process of conversion to a condo building. If the ballroom can survive until the sponsor no longer has control of the space, the owners could remodel what remains – though probably not to its former glory – and convert the space to a community room, both for use of residents and members of the community as it was for decades. Besides providing a sorely needed area for community events (the Grinnell community room being the only one available at present), the condo owners could derive another source of revenue from what is now a space that generates no income at all. Posted in 620 158th Street, 807 Riverside Drive, Audubon Park Historic District, Enesbe Realty, Nathan Berler, Rio Rita, Washington Heights Town Club. Bookmark the permalink. Riverside Oval Association 2014 Calendars Now on Sale!